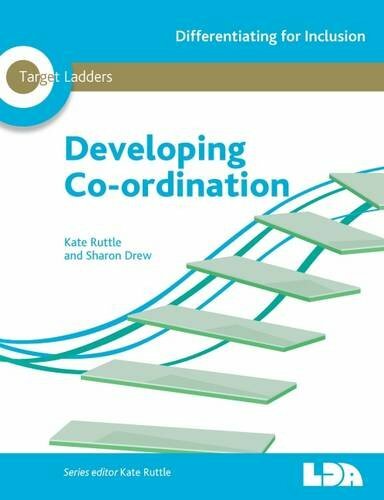 The book ‘Developing Co-ordination’ by Sharon Drew is the latest book from the Target Ladder Series edited by Kate Ruttle and published by LDA (2016). In Chapter one, Drew describes DCD simply and succinctly and gives some classroom observation tips for teachers and a supporting checklist. She highlights good practice and targeted support on how to create a DCD friendly classroom in chapter two and there are some great ideas in this chapter. To support focused target setting, seven different aspects of DCD are identified: gross motor skills and PE, ball skills, fine motor skills for the classroom, visual perceptual skills, handwriting and recording, executive skills and behaviours for learning. These aspects subdivide into four target ladders in order to support the identification of a child’s particular strengths and weaknesses. Each of the target ladders has 24 targets labelled from the simplest to the most difficult. Targets can then be set individually and a record of progress kept on individual children in a classroom. Ample suggestions on how to support and achieve the targets set are given. This process although it sounds confusing is very straightforward and easy to follow. The book also contains a CD with pdfs of useful pages from the book, a handwriting checklist for pupil self-assessment and some further reading suggestions. I welcome the publication of this book and its focus on children with coordination difficulties/ DCD. These pupils are often an under recognised group in schools and this book should give greater awareness of the need to support these pupils. The book is an excellent and practical resource for busy primary teachers and those in resource/ learning support. Whilst I feel it would be most useful for primary teachers, there is some useful information for the early years in secondary schools. The breaking down of targets would be very useful for planning and writing IEP plans in schools and would give very sound support for pupils with coordination difficulties /DCD. The aim of the series of books is to focus on what the child can do in order to identify the next steps. It supports the ‘Assess, Plan, Review, Do’ cycle, which is good practice in many schools and should help narrow the gap between pupils with coordination difficulties and their peers. I would strongly recommend that primary schools obtain a copy of this book for their staff library so that learners with coordination difficulties in their classrooms can be supported to reach their full potential. I also look forward to using it to support my own planning and teaching. Now on Sale from Dyspraxia/DCD Ireland for €25 + postage. Contact us at 01 8747085 to place an order.